▪ Quick-ship showcases come fully loaded with sliding mirrored doors with factory installed plunge locks. Fluorescent lighting is pre-wired and ready to plug in. ▪ Showcases feature aluminum frames with a choice of 5 standard laminate base colors. ▪ Showcases are 38” high and 20” deep. Wood bases are 16" high, with 4" high black kick bases. Glass display area is 18” high with one row of adjustable glass shelving. ▪ Showcases include open lower storage areas. Shelves sold separately. 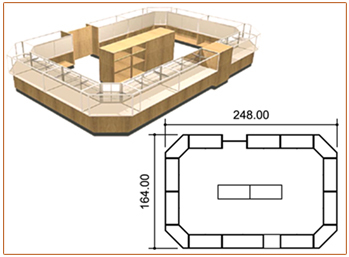 ▪ Wrap counters are 38" high and 20" deep with 2 rows of adjustable shelves. ▪ Register stand is 38" high and 20" deep with a flat top. Includes one drawer and one adjustable shelf.